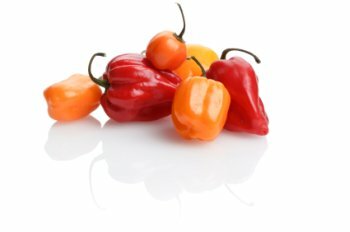 Habanero chillies can be green, yellow, orange or red. Habanero chillies are native to south Mexico. It has a lantern shape and is about 5cm long. Habanero is one of the hottest chillies grown Packed with Copper, Fibre, Iron, Magnesium, Manganese, Niacin, Potassium, Protein, Riboflavin, Thiamin and Vitamin A, B6, C, E and K plus all the heat you need to spice up your cooking.